Each club was sending its ace to the mound for the elusive triumph. A rematch of Game Two was on tap as Brooklyn’s Burleigh Grimes and the Indians’ Jim Bagby would toe the rubber. Grimes was the winning hurler in Game Two at Ebbets Field, shutting out the Indians, 3-0. Grimes had given up seven hits and four walks, but his spitball and fastball had let the Tribe advance only one runner to third base. That was in the eighth inning when Grimes issued three of his four free passes. Bagby, who notched 31 wins for Cleveland in 1920, surrendered two earned runs in the defeat. He did not strike out a single batter in six innings of work. The Cleveland batters thought they were on to something when they zeroed in on the tendencies of Robins catcher Otto Miller. “Each time he tossed dirt forward a spitball was delivered, the fastballs coming when he threw dirt between his legs to the rear.”1 When the word got out after the Series, the Robins brushed it aside. Grimes especially decried the use of dirt, in any manner, as a way of giving signs. Much like the day before, thousands of people milled around League Park before the gates opened on this Sunday for Game Five. There were some wry observations that there must be a lot of empty pews in the churches of Cleveland. It seemed as if everybody, whether they had tickets or not, was milling about at E. 66th Street and Lexington Avenue. Some fans were perched atop houses across the street, getting a different vantage point of the day’s events. The Cleveland Plain Dealer reported that neighboring churches around the park where in morning services as the stands began to fill up. Sermons were punctuated with shouts of “Hooray for Tris!”2 Player-manager Tris Speaker was who the congregations were cheering. The future member of the Hall of Fame was in his fifth season with Cleveland, after a stellar career with the Boston Red Sox. The pattern of scoring in the first four games of the Series indicated that whichever team crossed home plate first won the game. Also, of the 16 runs scored by the two teams, 13 came within the first four innings. Game Five would follow both of these patterns. Bagby surrendered a leadoff single in the top of the first inning, but allowed no further damage. Charlie Jamieson led off the bottom of the frame hitting a ball to Ed Konetchy that the big first baseman could not field cleanly, and Jamieson was given credit for a hit. Bill Wambsganss followed with a clean single to left field. Tris Speaker laid down a bunt toward the mound, and when Grimes fell down trying to hurry his throw, Speaker had a hit. With the bases loaded, Elmer Smith crushed a home run over the right field wall and the 45-foot screen atop the wall. It was the first grand slam in World Series history. The Cleveland fans erupted at the historic blast, and the noise did not let up for the remainder of the game. Bagby was not that sharp either. Brooklyn was getting hits, but couldn’t convert them into runs. In the second inning Konetchy ripped a line drive to deep left field for a triple, his first hit of the World Series. Robins second baseman Pete Kilduff then lifted a fly ball to left field. Jamieson made the catch and fired home to catcher Steve O’Neill who tagged out Konetchy for a twin killing. Cleveland increased its advantage in the fourth inning when Doc Johnston singled off Grimes’s leg. He went to second on a passed ball charged to Miller. A groundout by Joe Sewell got Johnston to third base. With Bagby on deck, O’Neill was given a free pass with the hope that the Robins could turn two. Bagby upset that strategy with a home run to right center, the first home run by a pitcher in World Series play. Cleveland led 7-0. In the fifth inning the Robins got consecutive singles from Kilduff and Miller. Pitcher Mitchell stepped up to the plate and hit a liner to second baseman Wambsganss. Wamby moved to his right, leaped, and snared the liner. The runners were moving, and Wamby stepped on second base, turned, and tagged a shocked Otto Miller barreling toward him for an unassisted triple play. The Robins catcher was not the only one caught off guard. The whole park fell silent, trying to figure out what had just unfolded on the field. Then cheers erupted through the autumn air. 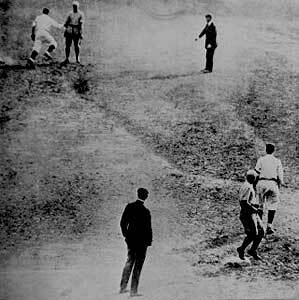 Almost a century later it remained the only unassisted triple play in a World Series. Cleveland added another run while Brooklyn scored its only run in the top of the ninth inning to avoid a shutout. Unbeknownst to the Robins at the time, it was the last run they would score in the Series. Cleveland won 8-1, and then shut out the Robins in the next two games to close out the series. 1 Joe Niese, Burleigh Grimes: Baseball’s Last Legal Spitballer (Jefferson, North Carolina: McFarland and Company, 2014), 69. 2 Fred Charles, “Fans in Ecstasies as Tribe Triumphs,” Cleveland Plain Dealer, October 11, 1920, Gr: 3. 4 Cleveland Press, October 11, 1920. 5 “Proud of Every Indian in Game Spoke Declares,” Cleveland Plain Dealer, October 11, 1920: 15.